If you’re looking for a wheely good toy for the kids that will get their bodies outside while they have a rollicking fun time, you can’t go past a skateboard. And because kids are tough on these things with flicks and tricks you want one that’s going to go the distance – and for that, we turn to the skate giant, Globe. The Globe Bantam skateboard is an excellent choice for kids wanting to launch themselves into skateboarding. A comfortable stiff build, the Bantam board boasts wider set trucks (they’re the hardware that attach wheels to the deck, thanks Google) so kids can keep balance confidently. Bonus points for durability, Globe claim that their Bantam skateboard is made to last longer than any other board in the market, which is comforting knowing full well the kids will give it a beating in the name of fun! Two deck sizes are available in the Bantam range – 15x58cm ($149.99) with swallow shaped tail or the slightly larger 17x60cm board ($159.99). Choose from a whack of fun, brightly coloured graphic covered boards, I’m a tad partial to the Leopard print myself, as well as a swag of clear boards. Globe Bantam boards arrive in one piece, requiring no assembly and ready to jump on from the get-go. 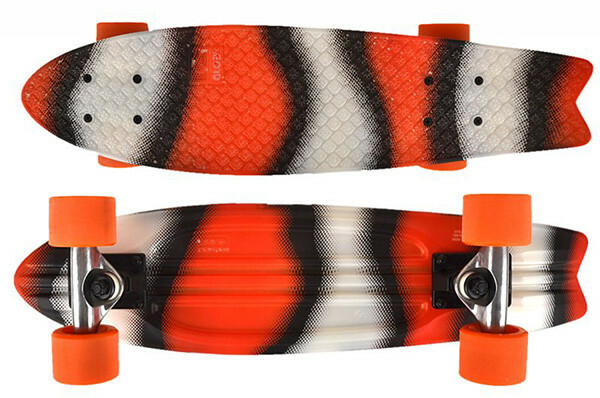 If you think the kids will be totally stoked with a board of their own, you can order direct from Globe, which offers free shipping on purchases over $50, score!